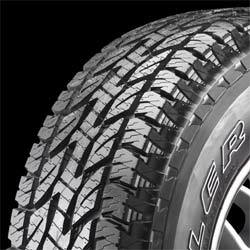 I have upgraded my factory tires from Dunlop Grandtrek TG35 P265/70/R16 (31")All Season Radials to Bridgestone Dueler A/T Revo with UNI-T AQII P265/75/R16 (32") Standard Load. These tires are approx. 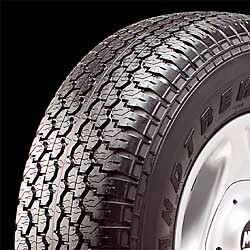 1.3" larger than the factory tires and require no lift to fit without rubbing. I had them mounted with the blackwalls out, and the outline white letters facing in. The factory Dunlop Grandtrek TG35's lasted me just about 40,000 miles. The R- or S-speed rated Bridgestone Dueler A/T REVO tires feature outline white letter sidewall styling on one sidewall and stylized black letter styling on the other. They are available in popular P-metric, LT-metric and Flotation light truck sizes for 15" and 16" wheel diameters. As mentioned above, the factory Dunlop Grandtrek TG35's lasted me just about 40,000 miles which took about 6-1/2 years to put on. 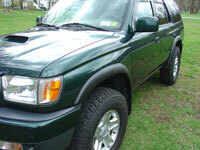 After them I upgraded to these Bridgestone Dueler A/T Revos. These Revos were such an improvement over the factory issued tires that I will never again waste the first 40k on factory tires, but rather I will upgrade from day 1. I was able to get 40,000 miles out of these tires and at that point couldn't really push it any further at all. This took me about 7-1/2 years to hit this mileage. I rotated them every 5,000 miles and ran with between 40#-42# air pressure at all times. 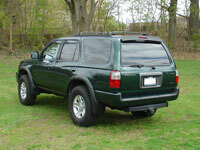 I was very happy with these tires throughout their life and would not hesitate to recommend them or purchase them again. They offered excellent traction on-road in all conditions, dry, wet, snow, all while performing quite well off-road when needed. They have had absolutley no road noise over the factory all season tires.